No longer resigned to lounging on the couch on Sundays for every football game ever, no longer for painting or yardwork or staring at that weight bench in your basement you keep intending to use. What? No, you will, I know. Next week. You’ll start your workout routine next week. No! No sir, not anymore are sweatpants marginalized and cast aside in favor of pants with their fancy zippers and buttons and measured waists. Who the hell do those pants think they are? No more! Sweatpants. Sweatpants are your going out pants now, because somewhere along the line we have devolved into a society where this is entirely acceptable. With sweatpants you get a a full range of motion, the possibility of keeping one pair your entire life no matter how fat you end up with their revolutionary stretchable elastic waistband; and, of course, the liberating knowledge that your balls are just bouncing free as you walk, unhindered by stiff, restrictive fabric that other “pants” fall victim to. The ladies will love that last bit. A man in sweatpants is DTF, you better believe that. And for the record, real men wear their sweatpants pulled up an inch above their ankles to properly show off the white socks they’re wearing with sandles. I was kneeling down, putting some books away on the bottom shelf when a husky, sweatpants clad customer who had a five-o’clock shadow on only half his face, stopped at the end of the aisle. When I looked up he gave me a big, wide-eyed smile and snapped the waistband of his sweatpants. “Yes sir!” he yelled and nodded at me, his eyebrows threatening to jump off his face, and continued on his way. “Ok,” I said to the now empty space he had occupied (well, what else do you say?) and went back to what I’d been doing. Until he came back. He always come back, that’s an important point to remember. You spoke while facing his general direction and that means you spoke to him. That means, as far as Sweatpants Guy is concerned, you are the only person in the store. You made the mistake of acknowledging his existence, something that apparently no one else has done in quite some time. See, you’re the guy in the horror movie that opened the creepy nailed-shut door behind a shelf in his basement his first night in the new house that he bought for a surprisingly low price that the rest of the town avoids going near. How many red flags do you need? The house was wearing sweatpants, why did you even look at it? Now you’re the guy that lets out the evil spirit that’s been trapped in there since the house was built over an old Indian burial ground. Now, you gotta pay the piper, because that evil sweatpants-wearing spirit will now feast on what is left of your retail soul. 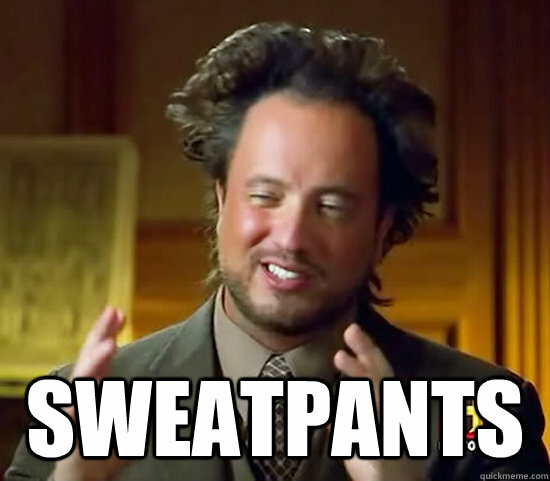 Anything else Sweatpants Guy needs to ask, that he needs to say, any other thought regarding his favorite snack foods or his opinion of the color green, anything at all that pops into his lumpy noggin that he inexplicably needs to speak aloud, he will find you, and he will tell you. And only you. Because you’re friends now. Sweatpants Guy popped back around the corner of the aisle about 27-seconds later—-he didn’t come back into the aisle, make no mistake about that—-he only leaned around the corner. And waited. I saw him out of the corner of my eye and took a deep breath. I’d been through this before. There’s no point in trying to avoid it or pretend he isn’t there. Sweatpants Guy has nowhere else to be. He can do this all night. He stared at me silently until I looked up. “Excellent!” he yelled, and pumped his fist int he air, and with a sweatpanty swish and a cloud of the cheap potpourri he rubbed on himself before leaving the house to mask that man-stink of indeterminate origins, he disappeared again, leaving me with the realization that he would probably get hired and I would be the one to argue with him that sweatpants were not acceptable work attire.